Reivers Rest at Otterburn Hall Lodges in Otterburn, near Bellingham, Northumberland sleeps 8 people. Otterburn Hall Lodges near Bellingham are four lodges, each with a hot tub on the decking, which offer differently styled accommodation for groups of six or eight. Ideal for holidays or visiting the two large wedding venues nearby in Otterburn. Leafy Run (ref W44043 [Leafy Run]) is a contemporary style lodge with a hot tub, and has a peaceful decked area. Decorated to a very good standard, and slightly smaller than its sister lodge, Squirrel Lodge (ref W44044 [Squirrel Cottage]) is the first lodge on the edge of this small exclusive park. Set over two levels, this quirky and unusual lodge is a lovely retreat for relaxing in, whether you are indulging in the private hot tub or sitting on either of the two verandah. Leafy Retreat (ref UKC2663 [Leafy Retreat]) has high spec granite worktops in the kitchen, built-in bedroom furniture and lovely bathrooms. 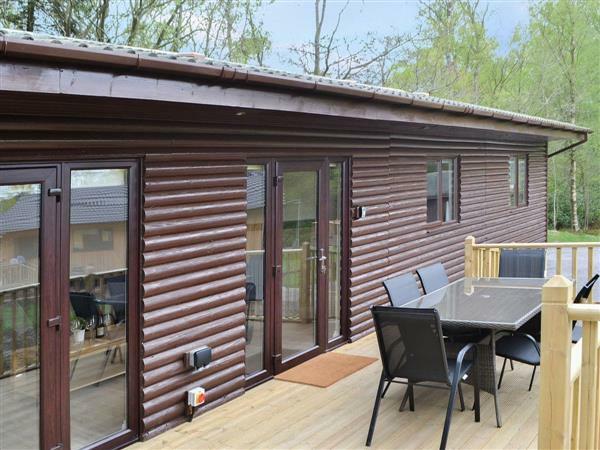 Reiver’s Rest (ref UKC3402) has been completely renovated in 2018, with a private hot tub on the raised south-facing decking and backs onto the woodland in the top corner of the park, with walks from the door. With a fully renovated restaurant on site, the lodges are less than a mile from the centre of the village of Otterburn, on the very edge of the Northumberland National Park. The park is just inside the Gold Tier International Dark Sky Park, the largest in Europe, ideal for stargazers and astronomers. The village has a mill shop, and the shop/café sells local produce. A highly acclaimed wedding venue, Le Petit Château is easily accessed only a mile away and guests can enjoy staying in the lodges and having some down time after the wedding. The long wooded drive up to the park sets the scene for your break away from the hustle and bustle of city life. A perfect base for couples or families to explore the Northumberland National Park, Kielder Forest and observatory, and the Scottish Borders. Situated 16 miles from the border counties, outdoor enthusiasts will love this location which is a favourite with walkers and adventure seekers. Bellingham is close by and has a choice of tea rooms, pubs and village shops. A day trip to Alnwick, with its famous castle, and the Northumberland Heritage Coast, which is peppered with castles and beaches, make for fine days out. Hadrians Wall is only a few miles away and is steeped in history, with Roman forts and museums along the way. Hexham and Rothbury are easily accessible, and have plenty of pubs and shops. The beach is 35 miles from Otterburn Hall Lodges near Bellingham. With the shop 1 mile, the pub is ¾ mile and the restaurant is on-site at Otterburn Hall Lodges near Bellingham. Ramp to entrance. Reivers Rest is all on the ground floor. Living area: With 55 Freesat TV, DVD player and patio doors leading to decking. Kitchen area: With electric oven, induction hob, microwave, fridge, freezer, dishwasher, washing machine and beams. Bedroom 4: With ¾ double bed. Electric central heating included. Private parking for 3 cars. All properties: Electricity, bed linen and towels included. Travel cot and highchair available on request. Large decking with sitting-out area and garden furniture. 500-acre woodland grounds (shared with other properties on-site). Hot tub (private). No smoking. Please note: The property has a natural water supply from a spring, and there is an unfenced lake in the grounds. Holidays at Reivers Rest, Otterburn Hall Lodges run from Friday to Friday. Pets allowed at Otterburn Hall Lodges - Reivers Rest. For a better idea of where Otterburn Hall Lodges - Reivers Rest is, you can see Otterburn Hall Lodges - Reivers Rest on the map below. Otterburn Hall Lodges - Reivers Rest is in Northumberland; should you be on the lookout for a special offer, you can find all the special offers in Northumberland. It's always worth checking to see what is on offer at the moment. Do you want to holiday near Otterburn Hall Lodges - Reivers Rest (UKC3402), you can see other cottages within 25 miles of Otterburn Hall Lodges - Reivers Rest; have a look to find your perfect holiday location.